This XY table is made from surface-treated aluminium. Fitted with adjustable dovetail gibs and three T-slots (12mm x 6mm x 5mm), it has an adjustable ruler, and zero-resettable handwheel dials. Both handwheels have marked 0.05mm graduations; 1 revolution = 1mm linear movement. Small and accurate, this table is ideal for use with the 28606 MB 140/S drill stand, MB 200 dovetail-way drill stand and 28128 TBM 220 drill press. The Y-motion is shielded from chips by a telescopic guard. For convenience, two sets of step clamps are supplied. Each set consists of a stepped block and mating clamp, and a T-slot nut and bolt. The sets are the same quality inserts that fit the PD 230/E and PD 400 mill/lathe systems. Used to drill off-set holes and to mill off-set slots, rectangles, hex shapes, etc. The scale on the housing enables high accuracy divisions. Chuck with reversible jaws: clamps 1.5 - 32 mm (internal) and 12 - 65 mm (external). 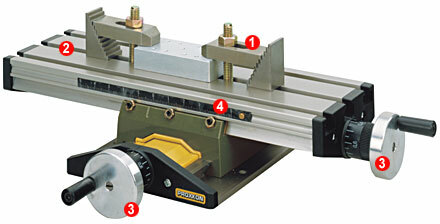 The 11 mm bore allows the passage of longer work pieces when used in the horizontal position. With fixation borings for horizontal and vertical assembly as well as suitable sliding blocks and fixation screws for assembly to MICRO Miller MF 70 and Compound Table KT 70. 72 x 64 x 38 mm. Supplied in wooden box with sliding lid. Table size 200 x 70 mm. Travel is 134 mm (x axis) and 46 mm on the y axis. Height 42 mm. Table size 200 x 70 mm. Handwheel with adjustable dials. 1 revolution = 1.0 mm, 1 division = 0.05 mm. Moveable ruler eases workpiece positioning. Proxxon Mill/Drill Unit BFB 2000. Click the button below to add the PROXXON COMPOUND TABLE KT70 to your wish list.